iDashboards is a business intelligence solution that is geared to be very friendly for all types of users who are searching for a software that allows them to fully utilize their information and made highly intelligent business decisions. The software fully espouses the use of data visualization technology, providing users with dashboards that display data via charts and maps and organize them via drill downs. Robust and feature-rich, iDashboards is quite easy to understand and implement. With a user-friendly interface that goes well with a vibrant display, iDashboards make it simple for users to know and comprehend their data and take smart and viable actions based on their reports. 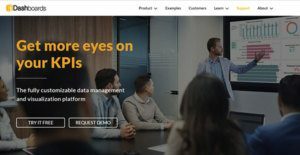 This interactive business intelligence software helps businesses adopt a new dashboard culture that makes data very clear and encourages transparency among and between users and management. iDashboards is created with the end user in mind. Aside from providing businesses with a business intelligence solution that works, developers wanted to create a system that makes data analysis and reporting more simpler to do and comprehend. With iDashboards, users get a business intelligence software that is not only powerful and feature rich, but so significantly easy that users don’t have to spend extensive time learning the software. Unlike other complicated business intelligence solutions, iDashboards is easy to learn and navigate, effectively cutting the time needed for users to get familiar with the software and use it to its fullest potential. As the learning curve is drastically shortened, businesses don’t have to worry about downtime and can immediately access and analyze data. Also, the system is built on a low-maintenance platform, reducing IT expenses while making it more adaptable to any existing infrastructure. Highly versatile in any business setting, iDashboards has become a leading business intelligence product, boasting of a long list of satisfied clients that the software helped in realizing their business goals. iDashboards is hosted in the cloud, which means businesses don’t have to worry about expenditures that comes with usual systems. There are no hardware to purchase and set up, no software to buy and install. If you are considering iDashboards it may also be a good idea to investigate other subcategories of Best Business Intelligence Software collected in our database of SaaS software reviews. Every enterprise is different, and can need a particular type of Business Intelligence Software solution that will be designed for their business size, type of customers and employees and even individual niche they support. You should not count on getting an ideal solution that is going to work for every business no matter what their history is. It may be a good idea to read a few iDashboards reviews first and even then you should pay attention to what the software is intended to do for your business and your workers. Do you require a simple and intuitive app with just elementary features? Will you really make use of the advanced tools required by experts and large enterprises? Are there any particular tools that are especially useful for the industry you operate in? If you ask yourself these questions it is going to be much easier to locate a trustworthy service that will match your budget. How Much Does iDashboards Cost? We realize that when you make a decision to buy Business Intelligence Software it’s important not only to see how experts evaluate it in their reviews, but also to find out if the real people and companies that buy it are actually satisfied with the product. That’s why we’ve created our behavior-based Customer Satisfaction Algorithm™ that gathers customer reviews, comments and iDashboards reviews across a wide range of social media sites. The data is then presented in an easy to digest form showing how many people had positive and negative experience with iDashboards. With that information at hand you should be equipped to make an informed buying decision that you won’t regret. What are iDashboards pricing details? What integrations are available for iDashboards? If you need more information about iDashboards or you simply have a question let us know what you need and we’ll forward your request directly to the vendor.